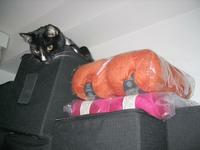 What would be a better way to spend the Friday evening than sleeping on boxes filled with yarn? Maxi demonstrates it here. But wait, what's that pink thing below the orange Jaeger Shetland Aran I recently ordered, thus also leading other people into temptation? 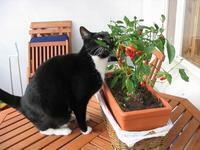 Oh, and look here (because distraction is a good), Jussi bought some chili plants and it was greatly appreciated by Mini! Det är farligt att läsa blogger, jag tror att minst tre personer köpte Shetland Aran efter de läste om det i min blogg. Tack till dig om det goda tipset!